The Bands all 17 of them. A magical mix of Alternative, Indie-folk, Rap, Rock, Prog and Bluegrass. Mayor’s Arts Award recipient, Shannon P. Laws is teaming up with Julie Guay, Executive Director of Blue Skies for Children, a non-profit organization, to produce their first collaboration album “Blue Skies for Bellingham” featuring Bellingham artists. Confirmed to appear on the album includes 17 local bands and bands that frequent the Bellingham area: 1967/Jaime Reynolds, Arthur James, Bad Tenants, Baltic Cousins, Hillary Susz, Hot Damn Scandal, Lipbone Redding, Lucas Hicks, Meghan Yates & The Reverie Machine, Mts. & Tunnels/Chris Poage, Mudflat Walkers, Polecat, Prozac Mountain Boys, Robt Sarazin Blake, Spyn Reset, The Copacetics, and The Sky Colony. The album and the original cover art by Meghan Yates, musician/painter, are being produced as items to bid on at the Blue Skies for Children’s 15th Annual Dinner and Charity Auction Saturday, October 17, 2015 at the Best Western Plus Lakeway Inn, Bellingham, WA. Event tickets are $75 per person. The Blue Skies for Bellingham album will be made available for public purchase after the auction as a downloadable album. 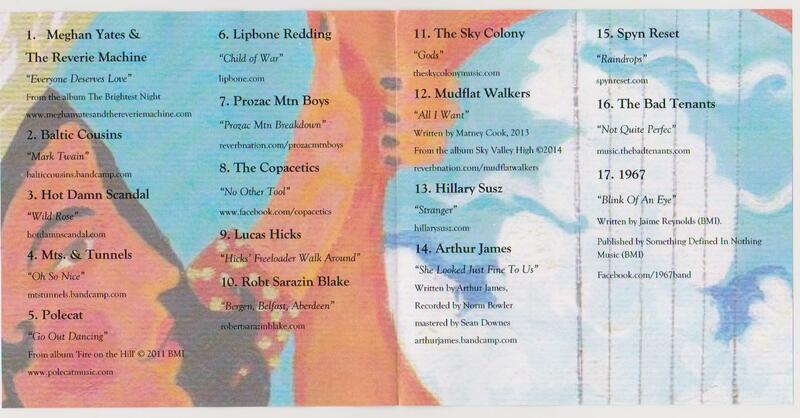 All album proceeds go to the Blue Skies for Children’s Our Little Wishes Instrument Loaner and Enrichment Programs. These programs provide low income, homeless and foster children ages six to fifteen living in Whatcom and Skagit County funding for music lessons and musical instrument rental to help increase hope and raise self-esteem.